A true Van Gogh bag! 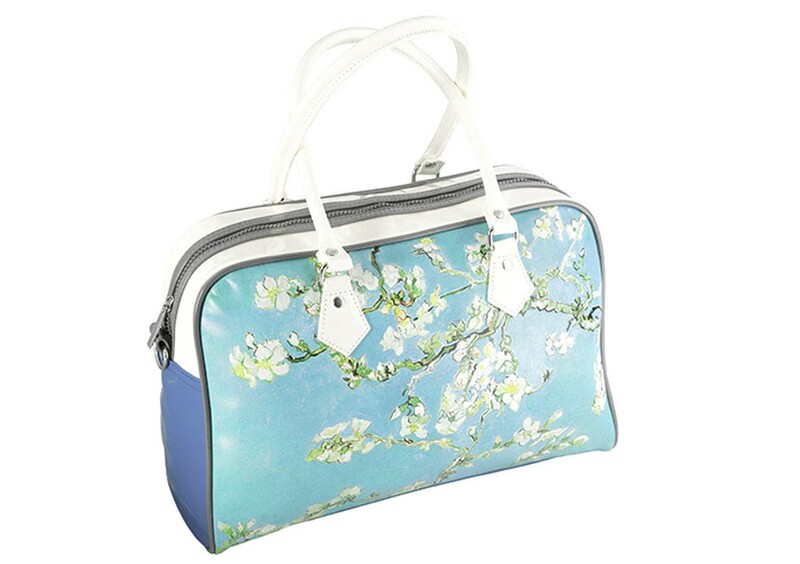 This bowling bag is fashionable and exciting: printed with a fragment of the masterpiece "Almond Blossom". These bags are made of sturdy plastic with an adjustable shoulder strap and zipper closure. The generous interior is padded and has a zipper compartment and a pocket for your cell phone. Practical, yet beautifully colored and styled. 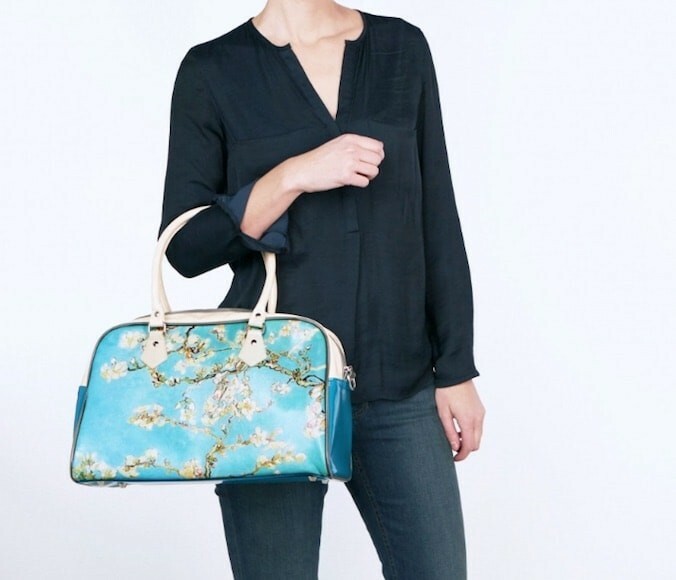 Fashionable and unusual is how you could describe this bowling bag style Van Gogh bag. 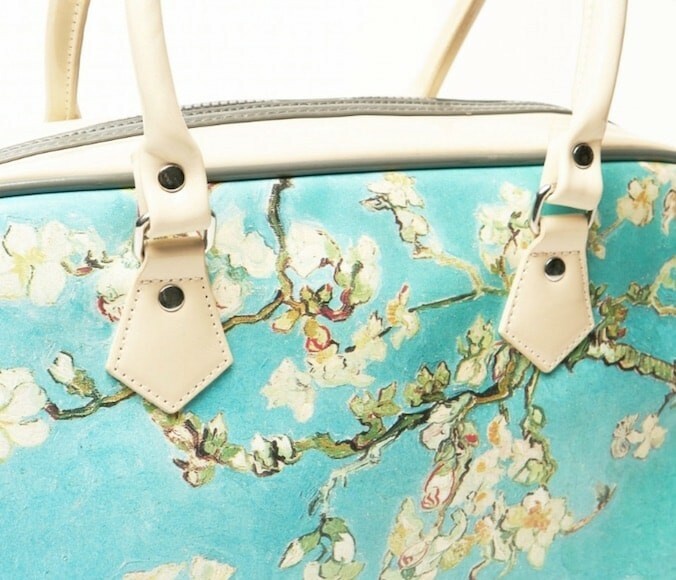 What distinguishes this bag is its print: the most characteristic excerpt from the famous painting Almond Blossom by Vincent van Gogh. These bags are made of sturdy plastic and come with an adjustable shoulder strap. The bag can be closed with a zipper, is padded, has an inside zipper compartment, and a pocket for mobile phones. 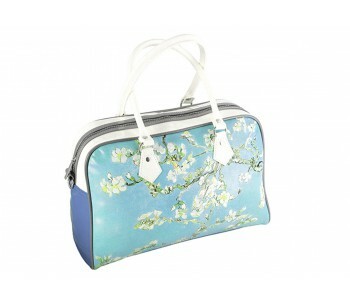 Because of its generous size (38 x 23 cm), it offers plenty of room to carry everything you need when you are on the go. Elegant yet practical. Van Gogh painted this sparkling still life of delicate almond blossom against a bright blue sky for his newborn nephew Vincent Willem. As a symbol of young life, Van Gogh chose the branches of the almond tree, an early flowering tree that heralds the spring as early as February. The subject, as well as the sharp contours and placement of the tree, was inspired by Japanese prints. Van Gogh had intended the painting to be placed above the bed of Theo and his wife Jo, but they actually hung it in their living room above the piano. It is not surprising that for the van Gogh family, it would always remain their most cherished work. Vincent Willem would later found the Van Gogh Museum. Van Gogh was born in the Netherlands and later went to live in Paris and other places in France. He did not have such a happy life and people in his lifetime disliked his beautiful paintings. In all his life, he managed to sell only one of his paintings. He earned no money and remained forever dependent on his parents and brother Theo. He takes to drink and is eventually admitted to a psychiatric hospital. In 1890, he decided - on advice of his doctor - to concentrate on painting and he made his final series: On July 29, 1890, Vincent van Gogh died, leaving behind more than 850 paintings and nearly 1,300 works on paper.